CoffeeScript seems to be picking up some momentum these days. No doubt, it is very valuable to help writing cleaner code. The command-line choices to run CoffeeScript compiler right now are either using Rhino (jcoffeescript) or using NodeJS. While I love NodeJS, seems that it is an overkill to require the entire NodeJS stack/infrastructure/package manager to invoke CoffeeScript compiler. Combining filejs and CoffeeScript is terribly easy. Just follow these steps. Note: filejs does not support Windows yet. Sorry. After you build it, copy both filejs executable and coffee.js to somewhere in your PATH. Usually I stash that kind of stuff in ~/bin and ensure that ~/bin is in my PATH. Make that file executable and then save it to ~/bin (again). Open coffee.js and modify the value of the compiler variable to point to your coffee-script.js. Note: this must use the absolute path name. 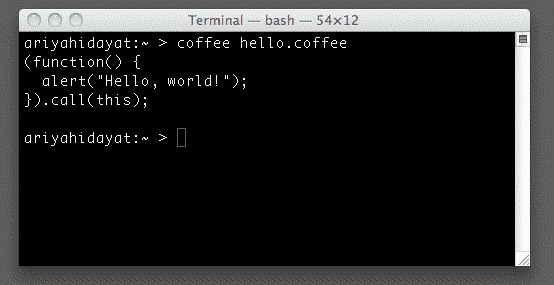 Feel free to tweak coffee.js so that it understands and passes various CoffeeScript compiler options!